I’ve posted notes of a Port Charlotte bottled by my Danish friend Jorn, a few months ago, and that was a total cracker. Jorn is a great person, a true whisky and golf lover, and apparently has a great sense of choosing good casks. 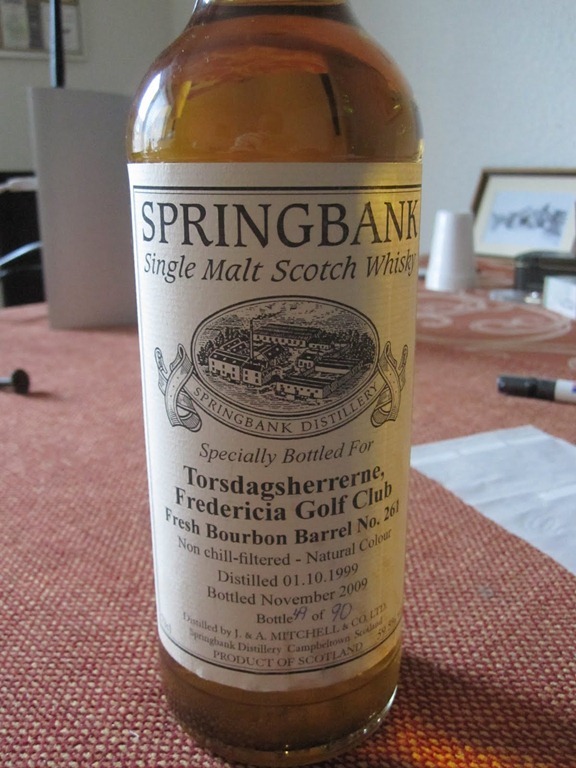 Now it’s time to enjoy his prior bottling a 10 year old Springbank he bottled last year. I heard great things about this expression from Steffen (@macdeffe , from whose blog I nicked the image) who is a fellow Dane, and a friend of Jorn’s (the person through which I came to know an meet Jorn). A few months ago, Jorn was visiting Israel, where he has a family, and gladly he brought over a bottle of this wonderful nectar. We could not meet, sadly, but I do hope we’ll meet soon and share a few drams in Tel Aviv. here is to his health, and many more outstanding bottlings like that. Nose: a lot of sea spray , some peat and sweet rose water and vanilla. Like dipping candy tin brine. Palate : Whoa! A powerful peaty palate. Much more than the nose suggests. Oily mouth feel , pepper and malt. Quite a lot of wood influence too for a teenager. This is indeed almost as Peaty as a Longrow! Finish: Long. Smoke. Butter wood and Some salt. many thanks to Jorn for his generosity and allowing me to sample this great bottling of his! where does he buy the casks from? Now I hear sb does not sell any more. Looking fwd to meeting you in the flesh! ;)over a few drams, of course.